LONDON, UK —Wikileaks Founder Julian Assange was forcibly removed from the Ecuadorian embassy in London on Thursday, bringing his seven-year stay to a dramatic and unexpected end. 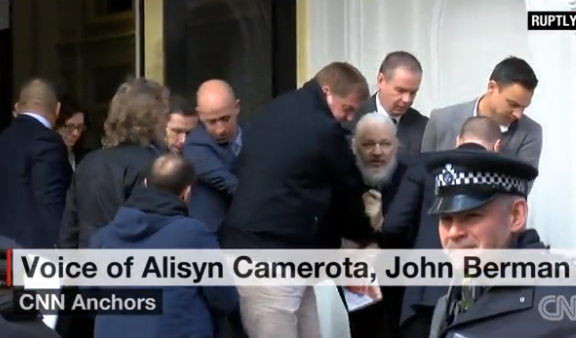 Video showed Assange with a full white beard being escorted out by police into a nearby van. Assange was arrested for skipping bail in the UK in 2012, at the request of United States authorities. Ecuadorean President Lenin Moreno called the decision to withdraw Assange’s asylum as a “sovereign decision” because of his alleged repeated violations. The U.S. Department of Justice confirmed Assange was indicted for conspiring to steal military secrets with Chelsea Manning, a former Army intelligence analyst who supplied thousands of classified documents to Wikileaks. The officers were able to arrest Assange after Ecuador withdrew his asylum and invited authorities to the embassy, citing his “bad behavior,” CNN reported. A judge called Assange “a narcissist who cannot get beyond his own selfish interest,” and found him guilty of breaking his bail conditions. He now faces up to 12 months in prison and is scheduled to remain in custody until an extradition hearing on May 2. Assange’s arrest drew strong reactions from all corners of the globe, with some including the ACLU speaking out against alleged violations of his rights.